It’s been a long, long, long, long time coming — as the iPhone 5 is now officially available in T-Mobile stores, through T-Mobile.com and through Apple’s website. Today marks the first time that T-Mobile has carried in store a device from each of the four largest largest smartphone platforms. T-Mobile now provides customers a complete set of options combined with the best new rate plans in the wireless game. In case you’ve lived under a rock and not reading TmoNews lately, the iPhone 5 will run you $99 down with 24 monthly payments of $20. As a special offer, T-Mobile is running a trade-in offer where customers can bring in their iPhone 4S and iPhone 4 devices to get the iPhone for $0 down play monthly payments. Depending on the value of their older iPhone 4 or 4S device, customers can also receive an extra credit of up to $120 good toward their monthly payments, existing T-Mobile bill, accessories or toward another device. The $120 credit is good if you wish to buy the iPhone 5 at full retail as well. Apple’s iPhone 4S and iPhone 4 devices are also available at select T-Mobile retail stores and online dependent on where T-Mobile has or is planning to refarm their network. This day has been a long time coming and while some of you will continue to sit firmly in the anti-iPhone camp, you cannot deny the idea that T-Mobile now has a complete smartphone lineup. At the very least, the appeal of T-Mobile’s iPhone pricing combined with their new rate plans will hopefully entice customers to stick with Magenta and stop the customer exodus that executives have long blamed partially on iPhone availability elsewhere. Questions about ordering from Apple.com and how the pricing works? See this previous post. Are you picking up an iPhone today? Finally!! !Welcome to all AT$T, Sprint and Verizon customers! An expand their bandwidth if a lot of customers decide to leave other carriers. Because TMO could get high traffic and the speed will decrease very much. Your gf would say the same thing about you if you stood next to me. These 30 thumbs up are justified! Same here. It’s small even compared to my Galaxy Nexus. Can’t do it. Just wait till the screen burns out. This is known problem of the note 2. Oh really? And where have you seen that? I hope the Apple store sells it for 579, not 549. Getting 2 today. I meant 579 instead of 649. If you use Apples Barclay credit card program they will give you a $70 bill credit which will bring the device down to $579. Even I have zero interest with Apple products, it’s definitely good a good device on better capacity network. I’m really upset that my pre-order didn’t ship until today and now says I won’t get it until Tuesday. Fantastic. Money well spent on that shipping. What shipping did you get? I got the cheapest one and it said Monday the 15th. I actually bought up to the 3-day! If you purchased 3 day shipping then Tuesday delivery would be correct if it went out yesterday. Not sure why you’d be upset? Because if jugjug got the cheapest and is getting his Monday, I paid $8 more and am getting it a day later. In addition, had I known I wouldn’t be getting it today, I wouldn’t even have bothered. I would’ve just went to the store. I hear you on that one, I tried to get cs to change my shipping method to the overnight. I pre-ordered the iPhone on 4/5 and chose overnight shipping. My iPhone shipped on 4/11 and according to ups tracking my package is out for delivery today 4/12 and will get to me no later than 3pm today. The one I ordered for my wife shipped yesterday on the 11th and is already in Chicago on the truck for delivery today. And I got them to waive 1/2 of the next day charge, plus they waived the $99 transfer charge from classic plans. This makes me want to cry. That was quick. Mine said it shipped yesterday too but when I check it doesn’t say where it is. I live in Chicago too. I am and always will be an android fan but I am still a t-mobile supporter and I am very happy that they finally got the iPhoney. until they can match the size of the Note II or at least the S4, i don’t consider buying one. i’m already spoiled by the Note II’s screen size. i don’t think i can get anything smaller than that. but yeaaaaahh tmo! Yeah, man. I can’t wait until someone releases an 8 inch phone. I don’t know how people used these tiny phones back in the day. Why stop at 8″? I can’t wait until someone releases a 42″ phone! I just got the note2 and this thing is a beast. Im happy tmobile finally got iphone but its way to late for me, but this should really help tmobile attract more customers. I love the performance of the Note 2, but the size definitely not. I know that thing is ridiculously big! And the Screnen is really low quality. Not an apple fan, but I need to leave verizon, and if that means getting the iPhone 5 for $360 unlocked brand new, i’m doing it. Credit check has nothing to do with it. He said unlocked (which means hes paying full price for an unlocked version), yet he quoted a price of $360 (when the regular full price is $579). Ok i got it. I didn’t read the unlocked part. I thought he was talking about the phone at buying it with te 24 month plan. I believe it’s $220 for both devices. Today is a great day for T-Mobile customers, those who were patient and waited for this device (didn’t jump ship) can now grab one at a great price compared to the competition. David, do you know if the the t-mobile version and sim free version both have AWS support? I read somewhere that only the tmobile will have the AWS support for several weeks until Apple finally switches over to only the unlocked AWS iphone. Reason for my question is that I have a warranty issue on my current unlocked iPhone 5 but would like to warranty it out for the new iPhone 5 which has AWS support so would rather wait a couple of weeks to make sure – just wondering if you know. Thanks. I thought about doing that but the phone they give you its a refurb so they will give you the exact model. Doubt they will go out stock on those anytime soon. This is true–the replacement iPhone they give you will be pulled from a separate room in the back, not from one of the retail boxes. The refurb will have all new glass, a new outer band, and a new battery, but the internals will almost certainly be the AT&T iPhone 5’s. Considering that it is just a radio update, just have them check if the radio firmware is equal to or greater than 3.04.25. That is the radio firmware on the iPhone 5 model with AWS. I just bought one. Sadly, I don’t have an AT&T model available to check if the radio firmware is the same. Interesting…because if you read here..
https://apps.fcc.gov/eas/GetApplicationAttachment.html?id=1925198 all they changed was the radio firmware supposedly. Therefore, I bet there is some stupid file that tells the radio to enable AWS. So a DFU restore to the next major iOS release might magically enable it. SInce it uses a similar chip, I am guessing something like what was done for the Note II is all that is needed. Thats good to know if someone do that work. I will donate to get mine working on AWS on TMO without having to buy another iphone. I have pretty much all the tools, just not an unlocked and jailbroken AT&T iPhone 5 to mess around with. Maybe I can find a smashed up one on eBay or something! When I ripped apart the ipcc file from T-Mobile, there is a section in the N81_N82_Overrides.pri file that controls some of the radio’s config, just like you would through QPST. I am wondering if we were to “guess” the correct key name and just add the hex value in, if that would be enough to enable it. I have the same firmware on on the old iPhone 5. I Just went to the apple store in White Plains NY. To buy a Sim free Iphone but wanted with Tmo AWS frequency. No is not the same. There still selling the old model (A128) I brought the tmo version so im expecting to have it sim free l I will call tmo to confirm and see because I dont want to have it unlocked before I travel. If is not then I return it to apple store for full refund. They are going to sell the same model but obviously with the AWS ready for tmobile. The only problem is to sold the rest A128 left in their stores. This will be a great phone for my wife. Why would anyone buy through Apple? you get the same 16GB but it cost more. So you can get it unlocked immediately. No. You can get the unlocked one. Not the one with the t-mobile sim in it already. It is identical to the T-Mobile version. actually it cost the same, its only $580 if do the uncarrier and are well qualified, if u choose to just buy the phone it costs $649.99 , for example if u go into tmobile and just buy the phone alone it will run u $649.99 not $580 . I just bought mine for $579 from the T-mobile store. where do I verify that info….from Barclay or Apple? As I’ve said a hundred times before, I don’t care for the iPhone but I do care about consumer choice. This is very good for t-mobile. I just left…there were about 10 people waiting at the store I was at. The systems are being slammed…they are printing manual invoices and then writing everyone’s credit card number down. Congratulations T-Mo! It’s been a long time coming but sure to make a lot of people very happy and should increase customer satisfaction and reduce churn. Don’t forget the 4 and the 4s. I was wondering about that. 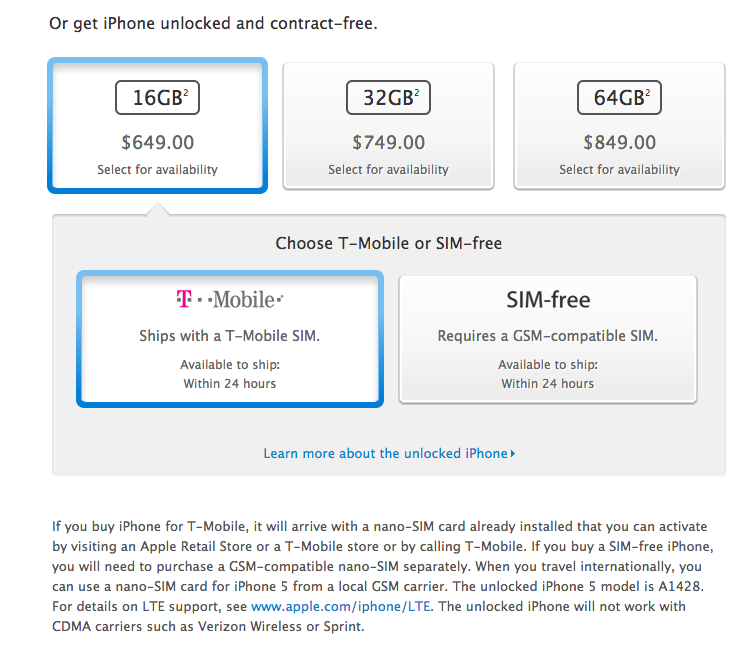 How can I find out where Tmo is selling the 4/4s? They are only selling the 4 and 4s in locations that it will get full 3G. If you go to the website, it should ask you to put in your zip code. I feel your pain. I just bought mine for $579 at the T-mobile store though. I have lots of apple store credit which I’d like to burn. Never thought I’d see the day. Congrats T-Mobile! WOO! 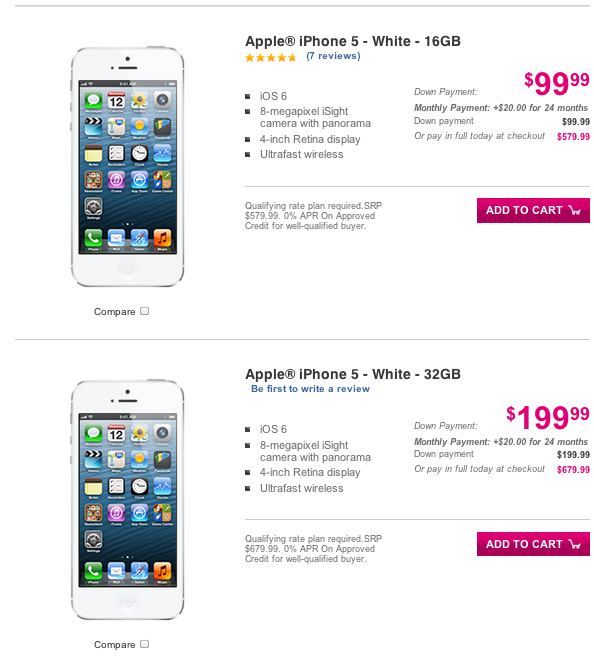 Just left the T-mobile Store…$579 for the 16GB! They got about 125 in for the whole weekend. They only got 125 iPhones for the whole weekend?? Just got home, went to two different stores and both there systems are down so I couldn’t buy mine. Guess I’ll be stalking Tmobile all day today ;) Minimal lines at both places. As I stated above, it’s the overload on the EIP system. It comes in fits and starts. Be persistent if you really want it. They called me back and I picked it up 20 min. ago. I am so happy for tmobile, but GS4 is the way to go. I just tried to pick one up for my sister and the system is jammed up because people are buying it up on rip. they took down my info and they will call me when the system is working well. A couple was working with the store manager at the till next to me, and they left after about 4-5 tries. As soon as they did, the logjam broke on the EIP hangup. Of course, the manager tried calling the Mrs., but it ended up going to her VM. Same with me. They called me back, and I just got the phone. Will be setting up tonight. So Customer Care, and two reps told me the phone would be $580 without a plan… Such a let down when you receive bad information. Guess I’ll be using the 4S for another few months. But this is the full price and has been well known. Why is this a let down or bad info? $650 at full retail vs $580 is a decent amount… Thats why its a let down. But Tmo stores ARE selling it for 580$ full price, no contract. Yes. And? You should re-read what you wrote. For some reason $580 is a let down? Did you mean you have to pay full price INSTEAD of 580 if you had no account/ service plan? That makes sence, since you would not be a t-mobile customer, their for, why in the world would they give you the discount? First store I called said $650. Second store I called said $580… Went into buy it, and POS rang it up at $650. Just got my new iPhone 5 from tmobile this morning, you do NOT have to change to the new plans. Also since I have been a customer for so long they gave me a free $50 credit on my bill for upgrading to the iPhone. Still on my old plan. Just thought I would share this since I am sure others were wondering like me if you had to switch plans. Do you have LTE ? They probably set you up on one of the newer plans with bridge to value unless you paid full price out of pocket. If you’re already on a value plan, you do not have to change to the new plans in order to do EIP. I just bought an iPhone this morning and did not have to change plans. Right, but if you’re on classic, and they drop your bill plus you get eip without migrating that’s btv. We rushed out a quick update to our app ‘Coverage?’ to show all the announced T-Mobile LTE and 1900MHz 3G markets – it is a great way to check and see what kind of signal you’ll get in the places that matter to you. I love that there is so much LTE out there now. Where we are at right now LTE is outperforming our cable modem – if only it didn’t have a usage cap! Just got mine. If you’re going, to any T-Mobile store, be prepared for a possible system interruption. The location I came from was having issues with the EIP agreement system. For me, it took four tries to go through (oddly, after two people ahead of me left after multiple tries to get their devices taken care of). It seemed to be system-wide due to the sheer number of requests (luckily for me, the line was non-existent when I got to the location), but it appeared to be moving as soon as I left. What iOS version did it come with? 6.1.3, T-Mobile 14.1 Carrier Update. NOT seeing 4G/LTE at this point (though I’m in a launch market (DC/Baltimore)). I got mine at 6.1.2 out of the box. Brought it from apple store. not surprising Apple did not post the $100 credit to bring the cost of the 16 gb phone back to par with T-Mobile’s EIP price. What a great day for T-Mobile and their subscribers (except the Android fanboys who refuse to see how this could help out TMO)!!! My wife’s arrived about an hour ago–can’t wait until she gets home to surprise her with it. She’ll be ecstatic to get off EDGE!! I’m tempted to get one just to complete the Apple ecosystem at our house, but I need a little more screen real estate. I don’t need Note 2 size, because frankly I think phablets are ridiculously huge for everyday use. But give me something Nexus 4-ish and I’d hop on it in a second. So to everyone who was complaining about the botched pre-order–did your phone ship last night just like TMO’s website stated? Mine obviously did and I never doubted that it would. Luckily I live 4 or 5 hours from where their phones usually ship from so ground shipping = me getting it the next day. so i can go in and just buy and IPhone for $579 without any modifications to my current plan??? Yes, basically if you pay $99 down you changed plans or you’re a new customers. Either way you’re pay that $579.99 so it doesn’t matter in the end. Thats the thing. I don’t want to change plans or put a down payment. I just want to go in, pay $579 and leave lol. You should be able to do that. Ugh why doesn’t Tmobile ever sell 64gb versions of phones?!?!? Nobody here like aple…I never regret in technology. I just got home! I was at the store about an hour, mainly because the EIP computer system went down and then the system wouldn’t let them change the SIM in the computer. It was all good though, there were 3 reps in and only me and 2 other customers, both getting the iPhone for that hour! We all were gabbing, laughing and joking and these were probably THE BEST REPS I HAVE EVER DEALT WITH. Just happy and excited to do their job. To top it off? I commented to my rep, who was the Store Manager, that I really liked the shirts and then she asked what size I was and gave me TWO FREE SHIRTS! Apparently they got in 8 of each t-shirt and they only have 10 employees there all who wear Small-XL, so the XXL and XXXL shirts would go to waste! I’m gonna promote T-Mobile today :D AHHH! Probably the BEST day to be a T-Mo customer. I should also note that I am coming from a Blackberry 9900 and at home I only got regular 3G with 2 bars. Now on my iPhone 5? I have FULL Bars on 4G and am getting 17mbps down and 4mbps up! Such a good day to be a T-Mobile customer! Am I crazy or is this iPhone unlocked for any GSM network regardless of whether you buy it from T-Mobile or directly from Apple? Haven’t followed this launch closely, but it seems like an amazing deal given that 3rd party unlocking is currently illegal. This stinks… only the 16GB version is available in stores (one store told me they had the 32GB, but I got there and the guy had been “wrong”). Tried ordering 32GB through the website, and get the same damn error messages I got when trying to pre-order. Would buy at Apple Store, but it’s $50 more expensive there. **UPDATE: Called Cust. Care, and a great rep helped me process the order over the phone. how many iphones do you think tmobile will sell today? There’s not going to be lines or crowds at T-Mobile stores. Remember when the media made a big deal out of Verizon getting the iPhone. Media sent crews to cover the stores, showing crowds waiting in line. Personally, I consider the iPhone market saturated. There’s only so many iPhone users to go around and the carriers are now fighting for the same customers. Can T-Mobile attract customers from other carriers? What can T-Mobile provide those customers to entice them to switch to a T-Mobile iPhone? And what percentage of current T-Mobile customers will “upgrade” or switch to the iPhone platform? Fact is, TMOUS has mostly Android users. What percentage those will want to switch platforms? What percentage TMOUS customers can T-Mobile entice with the iPhone to stop them from defecting to another carrier? T-Mobile has 34 million customers. Where did you get 24 million? For a single line, ATT offers unlimited minutes, unlimited text and 300MB data for $110 per month and $199 for iPhone 5. Verizon offers unlimited minutes, unlimited text and 300MB data for $80 per month and $199 for iPhone 5. T-Mobile offers unlimited minutes, unlimited text and 500MB data for $70 per month and $99 for iPhone 5. T-Mobile has no contract and the monthly bill drops to $50 per month after 24 months. Is this information correct? The T-Mobile unlimited would be $50(base)+$20(unlimited)+$20(phone) so $90, which would drop to $70 after the phone is paid for. The OP’s math is correct. They didn’t specify they wanted unlimited data but instead did their calculation on the “included” data with the plan. The OP is correct, they’re not asking for unlimited data. The $50 unlimited talk/text comes with 500MB of data. With the $20 monthly for a phone it would go to $70 (less monthly if a larger down payment is made). Reading comprehension fail on my part. It’s interesting though that even with unlimited everything it would still be cheaper than ATT. $50 (unlimited talk/text with 500MB of data) + $20 for a phone isn’t $70? This is correct. Remember, for $10 more you can get 2.5GB of data (should you need it) making the monthly payments (with EIP) $80. Same price as Verizon, more data and your bill is lowered when the phone is paid off. Man, it has been a long time coming. I’m going on my lunch break to a T-Mobile corporate store here in downtown Denver just to take a look at the iPhone 5 display and see how busy it is. Can someone who bought one at the store tell if the stores will run out? I live in Los Angeles area. Thanks! I’m in LA also, I went before it opened (in Torrance) and there was only 4 people there but they take like 20 mins a person! My brother in law was at the local Tmo store today grabbing an iPhone. He was with sprint but he hated how slow their network was and liked how fast my Nexus 4 was. Now he’s actually able to stream videos w/o a problem. I don’t qualify for the payment plan until May 14th because T-Mobile messed up and I paid only $50 for my line when I first opened it. BS! I was going to say that’s an understatement, but I guess that’s enough repetitions of “long” to emphasize the point. It will be interesting to see how this goes. While I guess T-Mobile does not want some customers, seems “well-qualified” customers are not likely to notice or give a rip about phone payment plans. So I’m confused, through apple.com it’s an unlocked iPhone? Yeah, since there’s no contract and Apple doesn’t want to finance it on their site. Is it just me or did anyone else here who pre-ordered their iPhone 5’s not get a sim card OR a sim tool with their phone and then were unable to activate the phone and were also told to go to a T-Mobile store to get the issue resolved??? I wonder how long it will take them to get the new iPhone when Apple releases it. Does anyone knows if you can trade-in a 3GS? Yes, I still have one and I was waiting for T-Mo to get the 5. Thanks.